Marty Friedman is an accomplished American guitarist who began in the metal realm and drifted into rock and pop. Aside from numerous solo material he was the guitarist fro Megadeth in its glory days. Friedman played on five albums for Megadeth, from the thrashing Rust In Piece in 1990 to the commercial Risk in 1999. At the time, he denounced heavy metal as limiting. His replacement in Megadeth was Al Pitrelli of Savatage. Friedman teamed up with Michael Schenker in 2001 to record an album using the Thank II monicker. More recently, he has resided in Japan. He speaks Japanese fluently. He hosted several Japanese TV shows, like Rock Fujiyama, and tours with Japanese acts when his schedule allows. The Exhibit B DVD arrived before Exhibit A on these shores. In 2013, Loopartists.com issued Exotic Guitar for adding a live guitar sound to a variety of musical genres. The loops were recorded by guitarist Marty Friedman. 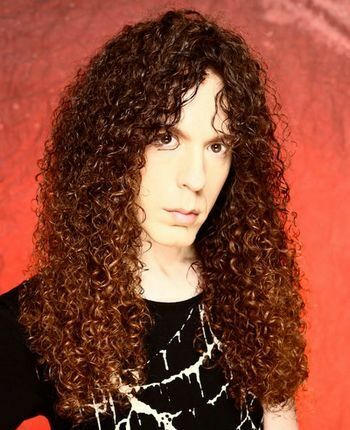 In late 2013, Marty Friedman was working on what he called his heaviest album to date. He was in California working on an album due in January, 2014. Marty Friedman picked Inferno as the title for his next solo album, which was due in early 2014 through Prosthetic Records. Guests on the record are Children Of Bodom's Alexi Laiho and Friedman's band-mate in Cacophony, Jason Becker. Marty Friedman would release a new solo album, called Wall Of Sound, on August 4th 2017 through Prosthetic Records. It is self-produced. Friedman was touring the USA with Scale The Summit and The Fine Constant. Marty Friedman would tour the USA in early 2019. A money-making and elitist scheme was in effect where fans could meet the man by paying extra. Friedman was born in Washington DC, but grew up in Hawaii hence the monicker for his many early bands. What a surprise to hear Marty Friedman shred metal like this after all his statements several years ago telling anybody and everybody how he much prefers pop to metal. He has recovered from his distaste for heavy metal. The current deluxe packaging is a recording of the former Hawaii, Cacophony, Megadeth guitarist in 2007 at an undisclosed location or locations tearing things up. Mascot Records has invested some dough in Friedman’s record and come up with a better package than even Paul Gilbert’s recent studio album. Not only the bulk of the material is truly heavy, but also the axe man has not lost his feel or fluidity. Elixir has some heavy chugging to go with it and Gimme A Dose even reminds one of a Megadeth song. The amazing guitarring continues through the album until the very end where the band - including second guitarist Ron Jarzombek - ends up performing a version of Elvis’ Hound Dog. Here we know why the album is an instrumental. The vocals are weak and used in the worst context.